The SNP must demonstrate that they offer more than Independence and grievance justification. Nicola Sturgeon this week marked her first year as First Minister. The SNP is hugely popular, Labour flatlining, the Tories marginalised and the Lib Dems irrelevant. The SNP-Labour relationship now seems a reverse of the 1980s. Then Labour sat for most of the decade on 50% in the polls with the SNP on 20% or less. Labour then was Scotland’s party; that mantle has now fallen to the SNP.Labour then was Scotland’s party; that mantle has now fallen to the SNP. No one is quite sure how we got where we are. That’s true of the benefactors (the SNP), the vanquished (Labour) and the on-lookers (everybody else). A common remark about how our country has changed is to say ‘Labour abandoned us. The SNP express the traditional values of Labour at its best’. It is a sentiment often heard, but seldom reflected upon. The SNP has become the party of mainstream Scotland. Like Labour before it, the party talks a radical game, one with a distant inspirational vision: once the battle cry of socialism, now the clarion call of sovereignty. Similarities don’t end there. Labour did little to change society once it became the political establishment. The SNP’s eight years in office have shown it has little appetite to shake things up in the here and now. The SNP increasingly faces an array of difficult choices. These include deepening public spending cuts, the potential constraints of new tax and welfare powers, the cost of maintaining big-ticket policies such as free care for the elderly increasingly at the cost of other areas such as local government, and the widening gap between rhetoric and reality. I asked twenty policy experts, from universities, the voluntary sector, trade unions and government, what the SNP should do towards the 2016 elections and beyond. They gave their candid advice anonymously as several advise ministers and wanted to be as honest as they could. The first area which came up was the style of politics. One person said, "I wish the SNP would get back to governing", while another reflected that the Nationalists had to "get out of the mindset of 'no bad news'’’. Second came what motivates and shapes government policy. One policy adviser stated that "the most important question for any policy is: why are we doing it?" They felt that with "most SNP policies they were unsure of the answer": were they really about "the common good, or because it works, or because it makes Scotland better". Another view was that "policy all seems about short-term headline grabbing." "policy all seems about short-term headline grabbing." Another concern is the philosophy of government: what it adds up to. One insider asked "where are the prevention policies, the big things that take us beyond the next ten years?" A related comment was that the SNP had for many years told a good story, but now had to shift into "a delivery phase with less declaratory policy", changing gear to suit difficult times. A range of policies emerged. One strong thread was that health and education had to dramatically change. One health practitioner stated, "Our NHS waiting lists are simply a stick for the opposition to beat the government. They have little clinical importance." On education, one expert said, "assessment is vital, but should be local and congruent to the individual child" rather than standardised. Another person working in the field stressed that Scotland had to "start making the connections between our hotch-potch of pre-school provision". Many emphasised that they admired the government’s commitment to childcare provision, but worried about resources, capacity and its potential being over-sold. There was anxiety about the economy. One economist observed that the SNP had to "prioritise their commitment to ‘inclusive growth’", which John Swinney has talked about, and flesh out what it would mean. There was also a need to say what was wrong about "the constantly referenced, but rarely explained ‘UK model’". Many other issues came up including the need to focus on taxation powers and supporting low income households, strengthening local democracy and halting command and control centralisation, while acknowledging the huge cuts which arts and culture bodies will face. A recurring theme was: treat us as adults. Be honest. We know tough times are coming. Don’t pretend otherwise. And don’t just blame everything on Westminster. 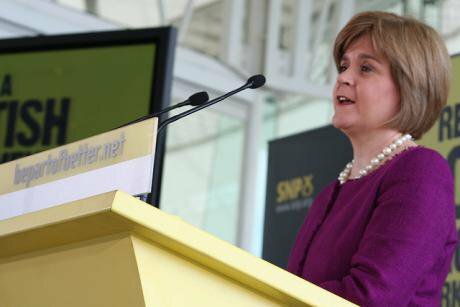 The SNP need to find an over-arching credo and mission – beyond independence. It needs to re-embrace the positive thinking it embraced in 2006-7 and which Alex Salmond has openly said changed ‘his mindset’. This entails focusing on the potential of a future self-governing Scotland – of a nation increasingly autonomous, distinctive and honest with itself about the challenges and difficulties it faces. It would not, for example, as the SNP have done recently, concentrate on whether this bit of ‘the Vow’ has been honoured or betrayed. The SNP have been at their best when bold and visionary, and at their worst, justifying the politics of grievance. It is time for the mature SNP. Scotland is ready for a more nuanced language and era of politics. That is Nicola’s Sturgeon’s challenge and opportunity. UPDATE: Since this piece was written Natalie McGarry, SNP MP for Glasgow East has withdrawn from the SNP whip and been suspended by the party pending the outcome of a Police Scotland investigation into financial irregularities relating to McGarry in her role with the Women for Independence group.